The materials in this monograph were originally prepared for an international conference of the same title that was presented in San Antonio, Texas March 27–April 1, 1983. The conference was sponsored by the Radiology Department, University of Texas Health Science Center, San Antonio, Texas, and was co-sponsored by the AAPM, the Bureau of Radiological Health, the IOMP, the WHO, and the Pan American Health Organization. 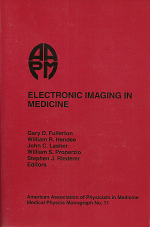 The conference and this book pulled together the disparate groups working on the application of electronic imaging techniques in medicine and provided an interface between high technology image engineering and medicine. Gary D. Fullerton, William Hendee, J. Lasher, William Properzio, Stephen Riederer, eds.